Getting work done on your damaged vehicle comes down to three things, quality, service, and cost. You want to be able to get the necessary work done on your car without getting ripped off, simple as that. That's why when you come to O’Connell’s Body Works, Inc. you'll never have to compromise quality for cost. Whether you're looking for collision repair, or are looking quality auto body repair, we have what you need. We go the distance to provide our customers with the highest quality of auto body service at the best prices on the market. In the photo at the right is John O'Connell III, Lic. Appraiser, Dawn O'Connell Harkins, Business VP and Office support, and Timothy O'Connell, Owner. Accidents do happen - What do you do? Sometime in our lives we will, unfortunately, be involved in an vehicle collision acccident. Although this is a most trying time for any of us we may not know where to turn or what to do. The staff at O’Connell’s Body Works has the knowledge to walk you thru this trying time. Please see our “Help” page for important information. Then contact us at 508-660-2528. Is an OSHA/EPA certified collision repair center (leading environmentally compliant shop). Is a Massachusetts Registered Repair Shop (RS2797). 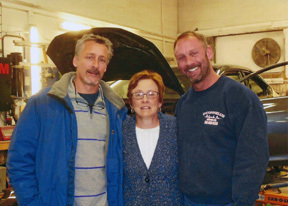 Is a member in good standing with the Massachusetts Auto Body Association. Carries a 2,000,000 liability insurance binder. © 2008 O'Connell's Body Works, Inc. . All rights reserved.